Your search for the coolest tote bag ever is over! Your bag is one-of-a-kind as it is cut from a handwoven Mexican blanket. This 15" x 15" x 5" day bag can easily hold beach accessories, music festival goodies, picnic supplies, and a whole lot more! Model is 5'5" with an 11" shoulder drop. Our serape blankets are handmade in Tlaxcala, Mexico. This high quality purse is durable, lightweight, and meant to be reused. Features an outside pocket for quick and easy access and an inside pocket to keep your keys or sunglasses separate and safe. We designed this bag to be fun and stylish, yet durable and functional. This beautiful woven bag is the perfect accessory for your spring and summer outings. The beach, Farmer's Markets, or just out and about, our bag is large enough for all your essentials. Use it as your work or school shoulder bag, or as a picnic basket. 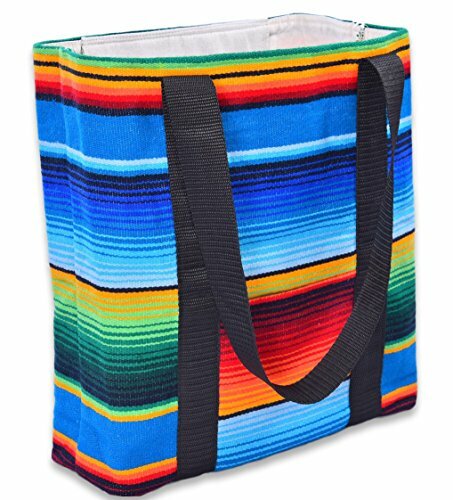 This Mexican serape bag can be that extra something needed for your fiesta! Take it to a music festival and blend in with the hippie purses and bohemian boho bags. Makes for a perfect gift for that special woman in your life, even if that woman is you! Mom, grandma, sister, daughter, girlfriend, wife, oh my! We stand by our bag with a 100% money back guarantee. If you are not completely satisfied with your purchase, your money back guaranteed. ONE OF A KIND - Every one of our handmade tote bags are unique as they are hand-cut from an authentic blue Mexican blanket. Your tote bag will look similar to the images above, but not exactly the same. SIZE - Our tote bag is 15" in depth; 15" in length; 5" in width. Shoulder drop is 11". Model is 5'5". QUALITY - Our custom handwoven serape blankets are created in Tlaxcala, Mexico. An interior serape pocket keeps easy-to-grab necessities separate and safe. An exterior pocket adding to the bag's charm. We designed this high-quality bag to be fun and stylish, yet durable, functional and lightweight. SO MANY USES - This beautiful bag is the perfect accessory for all year round. Great for running errands, picnics, and being out and about. Fits books, binders, and electronics for school, work, and travel. Fits clothes and toiletries for the gym, the beach, and overnights. GUARANTEE - We stand by our tote bag with a 100% money back guarantee. If you are not completely satisfied with your purchase, your money back. If you have any questions about this product by Baja Ponchos, contact us by completing and submitting the form below. If you are looking for a specif part number, please include it with your message.